If your name is HDawg, close your eyes (yes, my two-year-old reads his mom's blog, duh). Santa is about to divulge a few of his secrets from this year's Christmas list! HDawg has the VTech Go Go train set and it is one of his absolute favorite toys. I love this set because there are different sets that all link up together into one big track. Like a little village! This Christmas, he's getting a few add-ons like the airport and some extra cars. The amusement park and construction site look incredible too! I will admit that we have a lotttt of books already at our house. But with my kids, "a lot" is not enough! We read so many books every day that H is at the point he can recite most of them. And he's outgrown the "baby" books and is ready for lengthier story books. So this Christmas, we stocked up on a bunch of new books like Harold and the Purple Crayon and The Snowy Day. All little ones love balls and we're amping it up this year with a toddler appropriate soccer goal for H.
Lego Duplo toys are always a good idea for tots. There are so many cute sets available! I am a huge Melissa and Doug fan. We have the wooden clock puzzle and farm puzzle, and I'm eyeing the food play set and the tea set. Santa may or may not be bringing H the latch board, as well! There is nothing cuter than the Little People sets. Both of my kids love them! The Little People farm and nativity set are huge hits around here. And I think these sweet Little People Disney Princesses will pop up in someone's stocking this Christmas. Check out lots more amazing toddler-friendly toys at Target. Don't forget, they have free shipping through the end of the year on all orders! 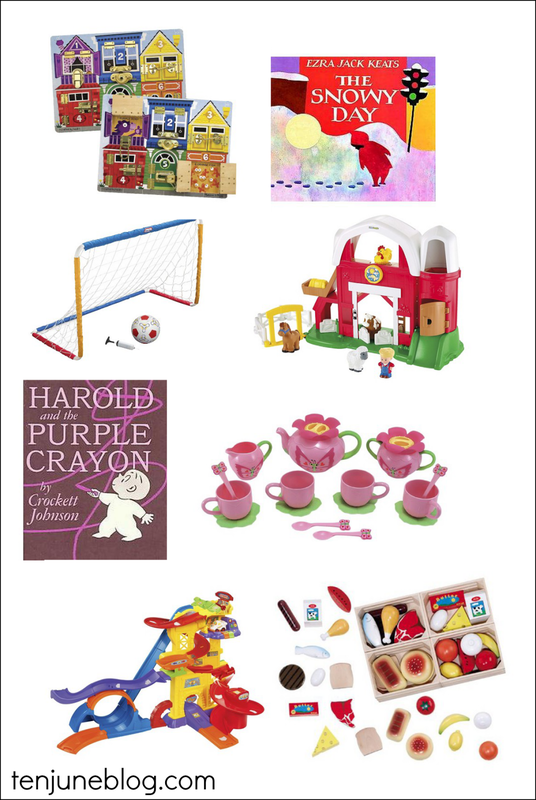 Thanks to Target for partnering up with me to share some of my favorite toddler toys. This came just in time! lol. Need to buy for my 2 year old nephew! Oh! That's awesome : ) He will like any of these items, I promise! Or a kid-size push lawnmower... ALWAYS a good idea! I miss the little people days! We had a little people nativity and it was the cutest thing ever! I knowwwwww! The nativity is our favorite, too. We always seem to lose baby Jesus though, which is equal parts hilarious and unnerving. "Babe? Where's baby Jesus? Did he get left out in the yard? Is Jesus under the couch?" HA!